BABY & FAMILY EXPO PHILIPPINES 2014, the country's biggest family expo where families love to shop, learn and play is on its 2nd year! 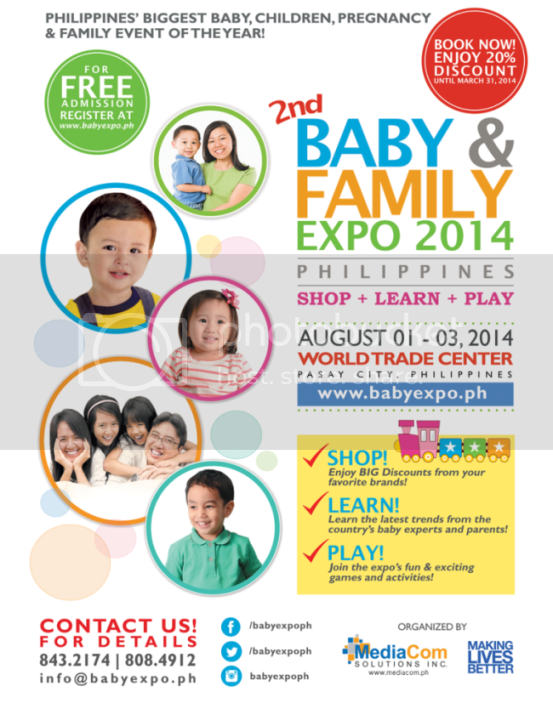 The BABY & FAMILY EXPO PHILIPPINES 2014 is a one-stop shop for all baby, children, pregnancy and family needs, happening this coming August 01-03, 2014 at the World Trade Center, Pasay City. The three-day event will cover the stages of family growth from maternity, newborns, infants, toddlers and children. Parents can learn the latest trends and relative tips from country’s experts about pregnancy do’s and don’ts, newborn and infant care, child development tips, parenting 101 and more. Last year’s Baby and Family Expo became the main event of the year for all maternity, baby, early childhood and parenting needs, with over 200 exhibitors as well as experts and celebrity parents like Regine Tolentino, Gladys Reyes-Sommereux, RJ Ledesma, Edric Mendoza, providing free seminars to expo visitors and fun-filled activities for the whole family. This year, a gallery showcasing fascinating toys and creations will spark the awe in children and rekindle the inner child of every visitor in the Baby & Family Expo’s Toy Museum inside the hall. Children can also enjoy fun and exciting rides and games with the World of Wonder. Fun-filled activities specially organized to widen children’s horizon will also be set up at The Imagination Kitchen, an arts and crafts station. Highlighting the exciting roster of events is the first ever Baby Idol and Kid Idol talent contest, where babies and kids can shine bright like a star showcasing their singing, dancing, and acting skills. Other activities to look forward to are the Family Olympics 2014, where moms and dads can show-off their diaper changing and grocery shopping skills, together with their kids for a cake decorating challenge. Another highlight of the expo is the annual Baby & Family Expo Awards Night, where outstanding celebrity families and entrepreneurs will be recognized through the Golden Family Awards and ParentPreneur Awards. During this three-day family event, visitors will get todiscover the latest products & services for the whole family, and avail of exclusive discounts from much loved stores and brands. “The BABY & FAMILY EXPO PHILIPPINES is going to be bigger and better this 2014 with over 5,000sqm of space area and over 400 exhibiting brands. We invite a variety of brands that have never been seen before in the country and created larger activity areas to give babies, kids, parents and entire families a great bonding experience” says MEDIACOM SOLUTIONS INC. President and Expo founder, David Abrenilla. The BABY & FAMILY EXPO 2014 is organized by MEDIACOM SOLUTIONS INC.- “Making Lives Better”, Philippines’ leading media, events-led marketing, communications, exhibition and convention organizing company. Part of MEDIACOM SOLUTIONS INC’s social advocacy is to nurture family development and child care, in partnership with leading foundations such as World Vision and UNICEF. BABY & FAMILY EXPO PHILIPPINES 2014 will be an experience families wouldn’t want to miss this year! Stay informed and get current updates by joining their community - Baby Expo Facebook Page www.facebook.com/babyexpoph , Twitter: @BabyExpoPh and visiting the website at www.babyexpo.ph. For queries, call +632-843-2174 or email babyandfamilyexpo@gmail.com.